If you like chocolate and chocolate likes you, you're invited to show off what the two of you can do together at the Kona Chocolate Festival, March 25 at the Outrigger Keauhou Beach Resort. A benefit for Kona Pacific Waldorf School, the festival is designed to show off the works of Big Island chefs, chocolatiers and ice cream and candy makers, while putting a spotlight on local cacao farming. One of the highlights is a chocolate taste-off, open to professionals and amateurs in categories of appetizer, entrée or dessert. Must be made with chocolate, of course. The festival also includes a daytime Chocolate Symposium that covers cacao cultivating, processing, medicinal uses and cooking. Nighttime events include a silent auction, live music, wine and specialty beers. To enter the competition, visit the Web site, www.konachocolatefestival.com. Or call 808-937-7596. The Rehabilitation Hospital of the Pacific is offering two cooking classes next week. Cost is $30 per class or $50 for both classes, which includes a tasting of the dishes presented. Low Sodium Cooking Class: Nutritionist Moana Bachiller demonstrates techniques to enhance low-salt diets, 5:30 p.m. next Wednesday. Leaner Cuisine: Dietician Nancy Chang offers tips for low-fat and low-cholesterol cooking, 5:30 p.m. Feb. 23. Reservations are required. Call 566-3780. 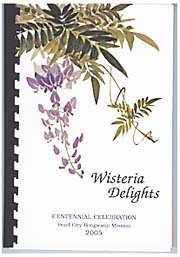 The Pearl City Hongwanji's benefit cookbook, "Wisteria Delights," is now in its fourth printing. The books continue to be sold for $12 from 9:30 a.m. to 11 a.m. Sundays at the temple, 258 Second St.
Or, if you're going to be in Waikiki Saturday, they'll be sold at the Western Business Information Technology conference, 9 a.m. to 2 p.m. at the Waikiki Marriott Beach Hotel. You could also plan to pick one up at the Taste of Hongwanji Bazaar, March 26 at the Honpa Hongwanji Hawaii Betsuin. Or call 455-1680 to arrange purchase another way.